Yoghurt is milk to which a bacteria (“Lactobacillus bulgaricus”) has been added, which thickens the milk, helps to extend its shelf life, and gives it a tangy taste. The bacteria feeds on the lactose sugars in the milk, changing them into lactic acid, which in turn curdles the milk proteins which thickens it into Yoghurt. There are many varieties. The variety range starts with the milks it can be made from: buffalo, goat, sheep, soy, yak, camel and of course, cow milk, which is what almost all of our commercial Yoghurt is made from. From there, they can be whole milk, low-fat or skim, and active cultures or dead cultures. Yoghurt made from goat’s milk has a sharper taste than that made from cow’s milk. The active cultures are sold with the bacteria still live in them, for the health benefits to our stomachs. The ones with dead cultures, though are course they are never labelled like that, are heat-treated to destroy the cultures on purpose, which extends the shelf-life of the product. Sometimes, a tub of whole milk Yoghurt may have a thicker, creamier layer on top. To reduce the fat content of the Yoghurt, you can skim this off with a spoon — and then eat it, as it is delicious. Whenever possible, add Yoghurt at the end of cooking, such as when you are making a soup. But if it’s a curry sauce you are doing, oftentimes the Yoghurt is best added the beginning so that all the flavours marry. In which case, stabilize the Yoghurt first with the flour method (below). If you are concerned about keeping the active bacteria alive during cooking, the temperature mustn’t go above 45 Celsius. If it goes above that; well, just think of all the other health benefits you are still enjoying anyway. When making your own Yoghurt, the shorter the setting time, the sweeter the Yoghurt will be: the longer it is, the tarter the Yoghurt will taste. Yoghurt with active cultures can aid digestion, help restore healthy bacteria levels in the stomach (especially important after a period of being on antibiotics) and because the lactose in it has been converted, can usually be eaten by people who have trouble with milk (but don’t count on this: depending on the brand, anywhere from 20% all the way up to 80% of the lactose can remain). Cures bad breath (other sources believe Yoghurt causes it). On some Yoghurt tubs, you may see the phrase “contains clockwise rotating lactic acid”. One type of lactic acid rotates clockwise, the other counter-clockwise. The clockwise is more easily digested. (note: Yoghurt tub weights given on the containers in oz are usually oz by weight, rather than liquid oz). You can freeze full-fat Yoghurts for use in cooking afterward, but freezing active Yoghurts will render your active bacteria quite inactive, as in morto. Defrost slowly, whisk before using as may separate a bit. The Turks were making it in the 11th century. The “Lactobacillus bulgaricus” bacteria was identified by a doctor named Stamen Grigorov (1878–1945) in 1905. The “bulgaricus” part of the name does not mean, as some mistakenly assume, that Yoghurt originated in Bulgaria. Instead, it’s a tribute to Grigorov, who was Bulgarian. 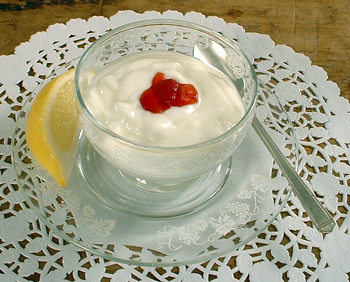 Commercial production of Yoghurt was begun in Barcelona in 1919 by Isaac Carasso. He named his business after his son Daniel, calling it “Danone” (meaning “little Daniel.”) The name was later Americanized to Dannon. “These friendly germs can be purchased by mail in capsules — 50 million in a capsule — four dozen capsules in a box sent to any address on receipt of one dollar. They are sold only under the trade name of YOGHURT. An interesting book describing these friendly germs, known to the trade as YOGURT, will be mailed free upon request by the Yogurt Company, 11 College Hall, Battle Creek, Michigan.” — Advertisement: “Friendly Germs for sale by mail.” New York Times. 24 November 1907. Page 27. Column 7. “Wanted — Lady or Gentleman in every town for local information. Good income. No canvassing. Yoghurt Co., Bellingham, Washington.” — Advertisement in “Bode Bugle”. Bode, Iowa. 16 July 1921. Page 7. Column 6. “Are you underweight? We can build you up with our drugless Fresh building treatement taken in your own home. Our emaciation expert will forward you explicity instructions for your own individual case. Free literature. Yoghurt Sanitarium. Dept F. So. Belllingham, Washington.” — Advertisment in: Oakland Tribune. Oakland, California. 19 November 1922. Page 85. Yoghurt is only now (2004) slowly becoming popular in India. “One of the important makers was the Dannon Company of Paris which, the year the war started, was turning out around 80,000 5 ½-ounce jars of yogurt a day, both fruited and plain. Daniel Carasso, son of the firm’s founder, transferred the business here in 1942. Now the product so carefully made in a modern laboratory factory in Long Island City has created a Manhattan boom in the consumption of this tart milk custard. Possibly the internationalizing influence of the United Nations personnel has had something to do with the rush of business. When the Assembly was still in session the United Nations Cafeteria sold 300 jars of yogurt a day. United Nations or not, yogurt is selling in unheard-of volume in some 2,000 outlets in the metropolitan New York area with a special route coverage through New Jersey and Westchester. Now plain platinum-blonde yogurt will be seen everywhere with its sister, the daring strawberry blonde.” — Paddleford, Clementine (1898 – 1967). Food Flashes Column. Gourmet Magazine. July 1948. The Natural History of Pliny, tr. John Bostock and H.T. Riley, London: Bell, 1856-93, Volume 3, p. 84.
 Business Wire Magazine. Colombo Yogurt – First U.S. Yogurt Brand – Celebrates 75 Years. 13 May 2004. Paddleford, Clementine (1898 – 1967). Food Flashes Column. Gourmet Magazine. August 1946. Yonan, Joe. Yogurt: The culture catches on. The Boston Globe, 11 August 2004.